As a little kid, Rich Horgan (MBA 2018) doesn’t remember thinking much about the differences between himself and his younger brother, Terry. But as he started to get older, he started to ask questions: Why does Terry have to go to University of Cincinnati every year for treatment? Why does he seem to struggle to walk? 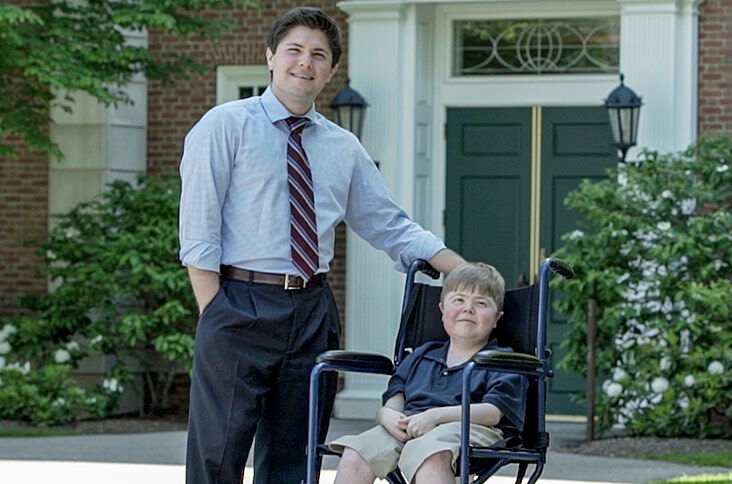 Horgan eventually came to understand that his brother suffers from Duchenne muscular dystrophy—a fatal, childhood genetic disease that impacts about 300,000 boys worldwide, and is characterized by progressive muscle weakness and loss. As a teenager, Horgan became goal-oriented, not knowing what was really necessary to save his brother’s life, but intent on laying some sort of foundation for success. The first step was an undergrad degree at Cornell, close to his family’s upstate New York home, and then on to HBS. While here, Horgan started two organizations—a biotech company called Myofinity Bioscience and a 501(c)(3) called Terry’s Foundation for Muscular Dystrophy. With the foundation, Horgan is trying to build something radical: A model for personalizing drug development, with the hopes of saving not only his brother but countless others. Morrell: Talk about your model as it exists now, because you’re approaching it in two different ways. Horgan: So I guess, taking a step back, there’s—at least in the biotech realm of the world —there’s two ways you can cut the cake, so to speak. The first way is, I have a really cool technology that I want to apply to a problem and that problem is not necessarily my passion. It’s just my passion is the technology, not the problem. That’s a great way of doing things. Many really good businesses have been built up on that. The other way, that’s more familiar to me, is saying, I have a problem and I need to fix it. I don’t really care what technology we use. So during my time at HBS here, I started two organizations. Essentially the theme is, let’s take as many shots on goal as possible. Let’s get capital from as many places as possible to take those shots on goal. And so I started both a 501(c)(3) foundation, Terry’s Foundation for Muscular Dystrophy, as well as a biotechnology company, Myofinity Biosciences. Those two organizations have taken two different paths. They’re not connected. The 501(c)(3), Terry’s Foundation, is doing something incredibly unprecedented. What that is, is it’s trying to develop personalized therapeutics for N=1, individuals, that customizes therapeutics. If you look at drug development thus far in the history of mankind, we’ve focused a lot of our efforts on small molecules, like pills that you would take every day—Lipitor, Viagra, these types of things. You’ll also notice that the cost of those has risen significantly. The productivity out of the pipelines has decreased significantly over time and so that begs the question of where do we go next for treating mankind’s diseases. One of those answers is personalized therapeutics. I had the fortune of taking a class over at the other grad school there, MIT, and I met a really great individual, Jonathan Fleming. Jonathan and I connected. He knew what I was about, Duchenne, and trying to save my brother and the boys like him. He suggested I meet with a researcher over at Boston Children’s by the name of Dr. Tim Yu. So I read up on Dr. Yu, and Dr. Yu told me about his story of Batten’s disease. Batten’s is not Duchenne. Batten’s disease is childhood ALS, basically. And the specific form that he worked on is very rare and very fatal. With the benefit of hindsight in telling the story, Dr. Yu encountered a little girl with Batten’s disease who was in very rough shape, with little to no hope and less than two years left. And so, over the course of a year, Dr. Yu and his team developed a therapeutic for this little girl, dosed her in January of 2018, and by that time she was in quite rough shape. She had maybe a few months left. Now here we are in almost December and not only is the little girl still with us, but she’s improved. This is powerful. This is for a disease that is fatal. The technology and the generalization of that technology is something that I honed in on. I said, “Well, Dr. Yu, could we do this for Duchenne?” And the answer was not no. The answer was never a certain yes, but it wasn’t a no. And that’s inspiring: to be able to say we can look at an individual and try to develop a therapeutic for their specific form of the disease. Morrell: Talk about where you are in terms of progress. Horgan: We’ve had the foundation now for a bit over a year, and we didn’t get oriented around this personalized medicine mission until a few months in. So, more or less, we’ve been at this personalized medicine bit for about a year. I have to say the progress in a year’s been really strong. To take a step back and say, so what is the mission? What is the tactical plan to get this done? It’s in four phases. The first phase is the analytical phase. This is where we take a blood sample, a muscle biopsy from my brother to dive into the details of what is making you have Duchenne? We know it’s a damaged protein, but we don’t know where, we don’t know how, we don’t know is he is producing any dystrophin that we can upregulate. So once we know if there is dystrophin being produced, how much, how it is being made, then we can start to say we can target what’s called antisense oligos. And antisense oligos, in this instance, would be something to bridge the gap, to try and upregulate, to make use of the silenced part of the gene. To use those, you have to be very specific and very targeted. Knowing where the mutations are in the gene, knowing is he producing any dystrophin, how he is producing it, informs us to be able to do computational prediction for creating a top 20 list of antisense oligos. With those, we can test them against his cell line. So as part of the biopsy, in phase one, we establish a cell line. What that is, is it’s taking Terry's cells and basically growing them so that we can test these computationally predictive therapeutics against those cells. So, remember, traditionally we test in mice, we test in dogs, we test in chimps, we test in humans. The important caveat is that mice, dogs, chimps—none of them are humans. Some translate; a lot don’t. And that’s where a lot of therapeutic development’s lost, is in translation. We try to bridge that gap by testing it in a humanized cell line, specifically the human that we’re trying to treat. And so with this cell line we build these predictive therapeutics; drugs, you can call them, but they’re not quite yet drugs. We build them; what we think will work. We test them in the cell line. That gets us down to about two or three antisense oligos that we’ll then fine-tune, then test in animals, and then move into a single-patient clinical trial. That create the top 20 is phase two. That fine-tune and test is phase three. And then phase four is the single-patient clinical trial. Morrell: So you are trying to build this new model of customized medicine and your first proof of concept is your brother. Horgan: That’s exactly right. And the idea isn’t just, let’s do this to save my brother, that’s my life’s mission. But, more broadly, let’s take this process, prove that it can work in a very tough case of Duchenne muscular dystrophy, and then generalize the model so that somebody comes in with a son, a grandson, a brother, and says, “We were diagnosed with Duchenne muscular dystrophy. What do we do?” In that sort of future world, where we’ve ironed out the generalized process, we can say we need a blood sample, we need a muscle biopsy. And then from there we analyze, do the same thing, create their customized list of potential therapeutics that could work based on their mutation, test them, fine-tune them, and then dose them. And there’s a lot of infrastructure that needs to change around that, right? The traditional model is test in animals, test in humans. And you need a lot of animals and humans to test it. The idea of a single-patient clinical trial is new. It’s only just begun. There’s the Batten’s case I spoke about. There’s another case of Canavan disease that has been recently worked on and has yet to go into clinical trial, although it is expected to by early next year. So you start to see these N=1 cases boil to the top for these really tough and fatal diseases. With that we can try to generalize the process so that not every family, not every brother has to go out and raise $2 million to save their brother. You know, two million bucks is, in the grand scheme of things, not a ton of money; but for what we’re trying to do, it’s really hard. There’s no good mechanism, there’s no good structure, to do this yet. Pioneering this customized therapeutic is where we’re at now. But the vision is to have a system in place, a funding mechanism—either a venture funding mechanism or in the future, more ideally, a payer mechanism, an insurance company mechanism—that will provide funding for it. So you don’t have to have these parents, these brothers, trying to go out and raise large sums of money to get this done. It’s a generalized process that would eventually and ideally be covered by insurance. Morrell: What have you seen so far in your experience that has given you hope? Horgan: At the end of the day, it’s the people that give me hope, that they’re there for the right reasons. Pharma nowadays gets a lot of negative press at pricing and things like that. It’s tough to say, but I don’t think that’s characteristic of the industry. I don’t know what’s the difference between something that’s been sensationalized versus actuality but the people, at the end of the day, are some of the best parts of this job. And the fact you’re doing something no human’s ever done before. No one’s ever survived Duchenne muscular dystrophy, ever. That’s pretty powerful, with the billions of dollars that have been invested into it. We’re aiming to be that difference. It’s inspiring to get out of bed every morning, to say what we’re trying to do is literally change the world, or this part of it. That’s quite inspiring. Morrell: How closely does Terry track your work? Horgan: It’s tough to say. I think he tracks it more than he alludes to. That’s a good question. I mean, at the end of the day it’s his life, right? I’m scared for him, and fear is a really good motivator and a better motivator’s love. At the end of the day, he wants to live and he should. He’s had his childhood robbed from him by this terrible disease. Your total physical manifestation is affected by this. You lose the ability to walk. You lose the ability to move your hands, to pick things up, to feed yourself. You know, imagine that. Imagine a little kid suffering from that while other little kids are going around and playing soccer and basketball. Sort of the mental damage that you have to suffer from that is—and I can only speak on his behalf, not for him, from his perspective—must be huge. I know it was huge for my family, and for him it must be all the more worse. Morrell: Rich, what worries you most? Horgan: The tough part about this disease, and something that we didn’t really talk about earlier on, is the time aspect of it. With a disease that impacts people that have it so differently, time is the one factor that’s consistent. These boys and young men that have this disease don’t have a lot of time. The average life expectancy is 20, 25 years old. It’s not a pleasant 20 to 25 years old. The other day, it was unfortunate, I looked on a Duchenne Facebook page, just casually reading it. They had a list of several boys that had recently passed away, to commemorate them. One was nine years old. Another was 23 years old. My brother’s 23 years old. We don't have a lot of time to do this. The idea, circling back to our earlier conversation about the biotech and the nonprofit, the biotech will take eight to 10 years to get a therapeutic on the market. That’s great. That’ll help a lot of kids. The personalized medicine development, we’re going to be done in two to three years, with a single proof-of-concept patient. That two to three years is critical. By that time, my brother will be either 25 or 26. What we need to do is move quickly to get this done. We can’t afford to wait until he is in a much worse situation to dose this. It’s just not okay, because we’re not at a point in time, if we’re successful enough to get there, where we can reverse the course of the disease. Right now, where we’re at is more of a pause, with moderate improvements. We need to get to there before we lose more because it’s so much easier to retain function than it is to regain function. That’s a big part of what I’m trying to do, is rally folks who hear this, who hear the message around personalized therapy, who have an interest in Duchenne muscular dystrophy, personalized medicine, rare diseases, helping a kid who needs help, at the base of it, to say we need support. We need to get in to people that want to help support this effort. Because it can, and will, make a difference in the world. It just needs to change the world in time. For more information on Terry’s Foundation for Muscular Dystrophy, visit terrysfoundationformd.org.